A green Halloween? Yes, it can be done. As you’ve probably figured out from walking into any store this October, Halloween has become a bit of a nightmare for the environment. These days anything short of an entire yard transformed into a lit-up plastic graveyard or petro-chemical-based spider hatchery has come to be considered un-festive. And here’s a spooky Halloween fact: Last year alone more than 40 million kids went trick-or-treating. All that adds up to a huge amount of consumerism and waste with ghoulish impacts on our environment and wild lands. That said, I love Halloween and I sure don't want to be the neighborhood curmudgeon who shuts herself in and turns off the lights on Halloween night. So I think I'll balance my guilt by having myself a green Halloween. I invite you to join me in any way you can. 1. Green Halloween Costumes: Leave the toxic Halloween costumes on the rack: Halloween costumes are supposed to be fun-scary, not scary-scary. Yet, store-bought costumes are often made up of nonrecyclable petro-chemical based plastic and synthetic fibers. Those Halloween costumes can include one of the scariest plastics--polyvinyl chloride (PVC), a soft plastic and known carcinogen that releases harmful toxins in its creation and breakdown. Avoid these toxic Halloween costumes and go for a green Halloween costume made of natural fabrics and materials. 3. Concoct your own fake blood: Similar to face paint, fake blood can contain stuff that's not so nice to mother nature. Try making your own fake blood from natural products. 4. 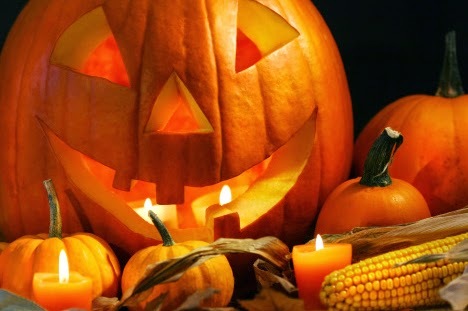 Shop the ultimate green Halloween markets: Last year alone 41.2 million kids went trick-or-treating, according to the U.S. Census Bureau. That’s a lot of Halloween costumes, not to mention the packaging they come in. Decrease the waste and have some fun sorting through costume selections at local thrift shops. These places have clearly beefed up their Halloween selections over the years, offering an inspiring selection of used costumes and period pieces these days. 5. Hold a green Halloween costume swap: Arrange a Halloween costume swap at your school, church or community center, or do it in your neighborhood. 6. Select not-so-scary Trick-or-treat bags: Avoid the ubiquitous bright orange plastic jack-o-lanterns that have no chance at ever breaking down in a landfill. Instead use reusable shopping bags, canvas totes or the ole pillowcase trick. A funky thriftshop handbag can add a fun twist to a green Halloween costume as well. 7. Choose green Halloween treats with less packaging: Decrease candy packgaging waste by buying in bulk and selecting Halloween candy that uses the least packaging. Candies that come in individual boxes have a chance at getting recycled, whereas those that come in plastic don’t. Other waste-less ideas include pencils made from recycled money, small coins or recyclable items that will find a useful place in a kid's life--as opposed to a home at the bottom of the garbage bin. One of our staff members reports of a neighbor who hands out books every year. Not a bad idea if you live in a neighborhood with light Halloween traffic. Endangered species chocolate gives ten percent of net profits to fund endangered species and conservation products. Yummy Earth certified organic sells individually wrapped lollipops that can be purchased at Wholefoods, Toys R Us, Vitamin Cottage, Sprouts and others. 9. Green up your Halloween Pumpkins: Buy organic. Save seeds for roasting with a little oil and light salt. Save the pulp for pies, muffins, soup and other recipes. Yum! Compost your pumpkins so they don’t add to the landfill where they will produce methane gas, a dangerous greenhouse gas. 10. Make your own green Halloween decorations. Halloween is the second biggest decorating holiday of the year, and so many of the decorations being peddled are made of non-recyclable plastics. If you do buy new items, at least choose durable non-petroleum based items that will last for many years. Otherwise, make a dent in the waste by creating your own homemade decorations with recycled household items. Giant Spider: Use black trash bags for a giant tarantula (stuff with garden leaves--or newspapers but be sure to recycle the newspapers and trash bags when you’re done). How to here. Ghosts: Stuff old bed sheets with leaves or newspaper, tie with a string to form a head and hang from trees. Spiderwebs: Make with shredded black pantyhose or cotton balls, instead of the sythetic messy ones from the store. If you're extra crafty, and want a dramatic look, weave a web of yarn near your entryway. Just select organic cotton or other eco-friendly yarns: Yarn web instructions. Halloween craft ideas from recycled items: To make these extra eco-friendly, choose non-toxic paints with low or no VOCs and other kid and earth friendly craft supplies. Plastic pumpkin makeovers: If you’ve already got plastic Halloween trick-or-treat pumpkins from yesteryear, the ones the kids have outgrown, but that are too faded or cracked to donate, don’t throw them away. Those pumpkins can be given new life. Just be sure to use non-toxic eco-friendly paint and second-hand props for these ideas Check out these ideas.